This article is about biomass as a renewable energy source. Biomass, as a renewable energy source, refers to biological material that can be used as fuel or for industrial production. It includes plant materials and metabolic wastes from animals and microbes. More specifically, it includes agricultural wastes such as straw, corn stalks, sugarcane leavings, seed hulls, nutshells, and the manure of farm animals. It also includes yard waste, wood, bark, and sawdust. Although fossil fuels (such as coal and petroleum) have their origin in ancient biomass, they are not considered biomass by the generally accepted definition because the original material has been substantially transformed by geological processes. 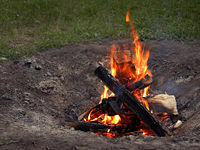 An example of a simple use of biomass fuel is the combustion of wood for heat. In this context, biomass may be burned to generate heat and electricity, or it may be used as raw material for the production of biofuels and a variety of chemical substances. Biomass is biodegradable and renewable. The production of biomass is a growing industry, as there is increasing interest in sustainable fuel sources. Industrial biomass can be grown from numerous types of plants, including miscanthus, switchgrass, hemp, corn, poplar, willow, sorghum, and sugarcane. It can also be obtained from a variety of tree species, ranging from eucalyptus to oil palm (palm oil). The particular plant used is usually not very important for the end products, but it does affect processing of the raw material. Plastics from biomass, like some recently developed to dissolve in seawater, are made the same way as petroleum-based plastics, are actually cheaper to manufacture and meet or exceed most performance standards. However, they lack the same water resistance or longevity as conventional plastics. Biomass is part of the carbon cycle. Carbon from the atmosphere is converted into biological matter by photosynthesis. On death or combustion of the material, the carbon goes back into the atmosphere as carbon dioxide (CO2). This happens over a relatively short timescale and plant matter used as a fuel can be constantly replaced by planting for new growth. Therefore, a reasonably stable level of atmospheric carbon results from its use as a fuel. It is accepted that the amount of carbon stored in dry wood is approximately 50 percent by weight. Though biomass is a renewable fuel, and is sometimes called a "carbon neutral" fuel, its use can still contribute to global warming. This happens when the natural carbon equilibrium is disturbed; for example by deforestation or urbanization of green sites. When biomass is used as a fuel, as a replacement for fossil fuels, it releases the same amount of CO2 into the atmosphere. However, when biomass is used for energy production, it is widely considered carbon neutral, or a net reducer of greenhouse gases because of the offset of methane that would have otherwise entered the atmosphere. The carbon in biomass material, which makes up approximately fifty percent of its dry-matter content, is already part of the atmospheric carbon cycle. Biomass absorbs CO2 from the atmosphere during its growth, after which its carbon reverts to the atmosphere as a mixture of CO2 and methane (CH4), depending on the ultimate fate of the biomass material. CH4 converts to CO2 in the atmosphere, completing the cycle. In contrast to biomass carbon, the carbon in fossil fuels is taken out of long-term storage and added to the stock of carbon in the atmosphere. Energy produced from biomass residues displaces the production of an equivalent amount of energy from fossil fuels, leaving the fossil carbon in storage. It also shifts the composition of the recycled carbon emissions associated with the disposal of the biomass residues from a mixture of CO2 and CH4, to almost exclusively CO2. In the absence of energy production applications, biomass residue carbon would be recycled to the atmosphere through some combination of rotting (biodegradation) and open burning. Rotting produces a mixture of up to fifty percent CH4, while open burning produces five to ten percent CH4. Controlled combustion in a power plant converts virtually all of the carbon in the biomass to CO2. Because CH4 is a much stronger greenhouse gas than CO2, shifting CH4 emissions to CO2 by converting biomass residues to energy significantly reduces the greenhouse warming potential of the recycled carbon associated with other fates or disposal of the biomass residues. The existing commercial biomass power generating industry in the United States, which consists of approximately 1,700 MW (megawatts) of operating capacity actively supplying power to the grid, produces about 0.5 percent of the U.S. electricity supply. This level of biomass power generation avoids approximately 11 million tons per year of CO2 emissions from fossil fuel combustion. It also avoids approximately two million tons per year of CH4 emissions from the biomass residues that, in the absence of energy production, would otherwise be disposed of by burial (in landfills, in disposal piles, or by the plowing under of agricultural residues), by spreading, and by open burning. Biomass power production is at least five times more effective in reducing greenhouse gas emissions than any other greenhouse-gas-neutral power-production technology, such as other renewable and nuclear energy technologies. In many cases, especially in Europe where huge agricultural developments such as those in the U.S. are not usual, the cost for transporting the biomass exceeds its actual value and therefore the gathering ground has to be limited to a certain small area. This fact leads to only small possible power outputs, around 1 MWel. To set up an economically feasible operation, those power plants have to be equipped with special (ORC) technology, a cycle similar to the water steam power process just with an organic working medium. Such small power plants can be found in Europe. Despite harvesting, biomass crops may sequester (trap) carbon. For example, soil organic carbon has been observed to be greater in switchgrass stands than in cultivated cropland soil, especially at depths below 12 inches. The grass sequesters the carbon in its increased root biomass. But the perennial grass may need to be allowed to grow for several years before increases are measurable. This list provides estimates of biomass from various sources harvested for human use and consumption. It does not include biomass that is not harvested or utilized. ↑ T.A. Volk, L.P. Abrahamson, E.H. White, E. Neuhauser, E. Gray, C. Demeter, C. Lindsey, J. Jarnefeld, D.J. Aneshansley, R. Pellerin, and S. Edick, 2000, "Developing a Willow Biomass Crop Enterprise for Bioenergy and Bioproducts in the United States," in Proceedings of Bioenergy 2000, Buffalo, NY: North East Regional Biomass Program (Madison, WI: Omnipress). Retrieved December 13, 2008. ↑ UVM.edu, Forest volume-to-biomass models and estimates of mass for live and standing dead trees of U.S. forests. Retrieved December 13, 2008. ↑ USA Biomass Power Producers Alliance. ↑ GMK, use of biomass by help of the ORC process. Retrieved December 14, 2008. ↑ Global Justice Ecology, How False Solutions to Climate Change Will Worsen Global Warming. Retrieved December 14, 2008. ↑ CTV, Biofuel crops may worsen global warming: study. Retrieved December 14, 2008. ↑ Energy Daily, Biodiesel Will Not Drive Down Global Warming. Retrieved December 14, 2008. ↑ USDA, Soil Carbon under Switchgrass Stands and Cultivated Cropland (Interpretive Summary and Technical Abstract). Retrieved December 14, 2008. ↑ Zhiqin Ma, Carbon sequestration by switchgrass, Abstract for Thesis (PhD). Retrieved December 14, 2008. ↑ R.H. Whittaker and Gene Likens, "The Biosphere and Man," in H. Leith and R.H. Whittaker, Primary Productivity of the Biosphere (Berlin, DE: Springer-Verlag, 1975, ISBN 0387070834), 305-328. Leith, H, and R.H. Whittaker. 1975. Primary Productivity of the Biosphere. Ecological Studies, Vol 14. Berlin, DE: Springer-Verlag. ISBN 0387070834. Rosillo-Calle, Frank, Peter de Groot, Sarah L. Hemstock, and Jeremy Woods. 2008. The Biomass Assessment Handbook: Bioenergy for a Sustainable Environment. Sterlling, VA: Earthscan. ISBN 1844075265.
van Loo, Sjaak, and Jaap Koppejan. 2008. The Handbook of Biomass Combustion and Co-firing. Sterling, VA: Earthscan. ISBN 1844072495. European Biomass Industry Association (EUBIA). 2008 study; Emerging Biomass Industry: Impact on Woodfiber Markets. This page was last modified on 9 June 2016, at 14:37.